Visiting the Whitsundays and doing a bareboat charter will be an experience to remember. Discovering secluded beaches and bays, ancient Indigenous rock art, white as white sand on beaches, towering hoop pines with resident Sea Eagles circling above and coral reefs are only scratching the surface of what you'll find. Explore a little further and you will find a number of bushwalks both on the mainland as well as the Whitsunday Islands with most of them offering amazing and gobsmacking views that only a photo can describe. Walk a little or a lot - choose from easy short walks to longer more difficult walks but the reward, in the end, is worth it. The Queensland Parks and Wildlife Service have a comprehensive 'Visitor Guide' that covers all of the bushwalks and lookouts across the various National Parks and State Forests in the Whitsundays with a copy provided on board your bareboat. Here are Luxury Yachts Whitsundays favourite bushwalks and lookouts of all time. 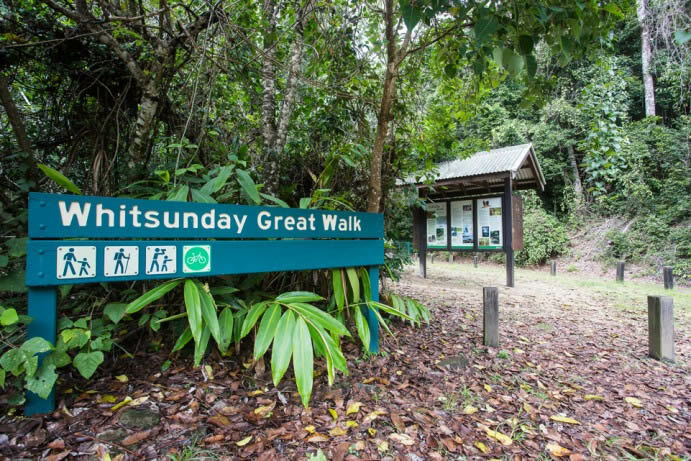 You'll need to have your own car for this walk, as it starts from the Forestry Road car park at Brandy Creek, approximately a 10-minute drive from Airlie Beach towards Proserpine. Pick up a self-guided brochure from the stand at the start of the track. It will guide you through the rainforest teaching you all about the wildlife and various trees you see along the way. You'll descend down to a freshwater creek where you can ponder on a log seat for while before making your way back up to the old logging road and back to the car park. Grade: Easy; Time: 25 minutes.